The “Dark Horse” battalion of the U.S. Marines will spend the next year field-testing new equipment, technology, and fighting methods that may eventually be used in the broader military. Marine Corps Commandant Gen. Robert Neller made the announcement on Feb. 19. According to Military.com, he announced the 3rd Battalion, 5th Marines, also called “Dark Horse,” will start testing the new gear and techniques in Camp Pendleton, California. The battalion has close to 1,200 Marines in it, and was first organized in June 1917 for the First World War, and has fought in every major American war since then. “They’re going to be our experimental platform, if you will, and we’ll give them capabilities and do it in an efficient way—which is, give it to Marines and let them figure it out, because they’re our best developers and experimenters,” Neller told Miltiary.com. 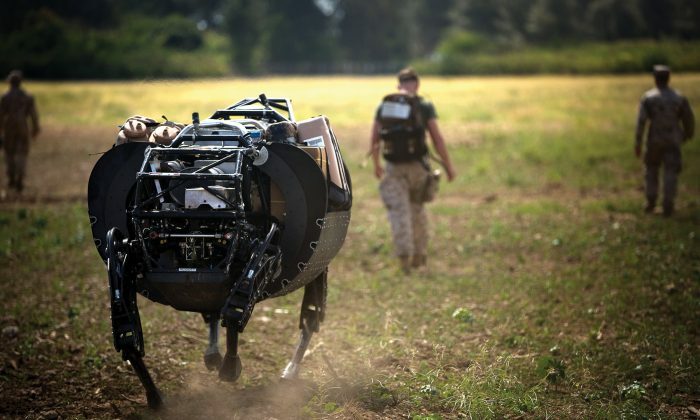 This is the first time the Marine Corps has designated an experimental unit. Neller said the original plan was to create a dedicated experimental unit that would work with the Warfighting Lab, but they decided creating a dedicated unit was too difficult, and instead went with an existing infantry battalion. They’ll be testing remote-controlled quadcopters and other small unmanned aerial vehicles. They’ll test new communications equipment, and will try new methods of operations for a rifle company. “So it’s organization, capabilities, technologies, how to distribute companies, how do we sustain them, how do we logistically sustain them, how do we make sure they have enough fire support, how do we move them?” Neller said. The new experimental unit ties with a broader shift taking place in the U.S. military. Under the new $582.7 billion defense budget for fiscal year 2017, the Pentagon has shifted its focus to potential war with China or Russia. “We will be prepared for a high-end enemy,” said Secretary of Defense Ash Carter in remarks on the budget on Feb. 2. “They are developing weapons and ways of wars that seek to achieve their objectives rapidly, before, they hope, we can respond,” Carter said.